This Simple Sweet Potato Quinoa Bowl is an easy, healthy, and delicious weeknight dinner or make-ahead lunch. Full of crunch and tang from nuts and cheese, this dish easily adapts to whatever ingredients you have on hand. This quinoa bowl is what I make for dinner most often when no one is looking. It’s my go-to meal when I’m not working on new recipes, when I’m tired after a long day, and when I’ve definitely had too much take-out pho for one week. 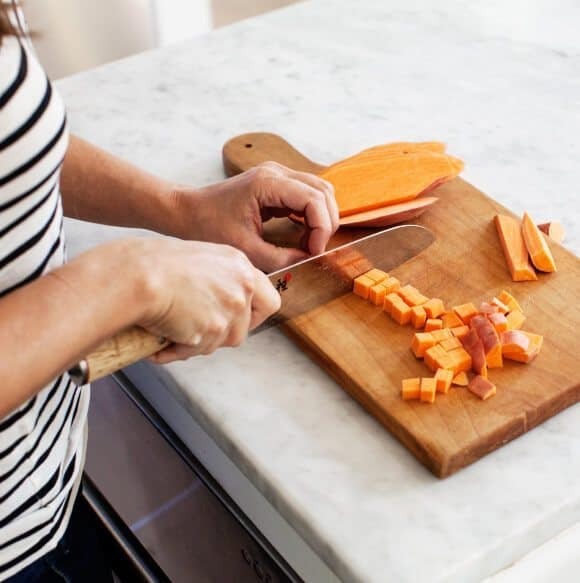 It’s not a 30-minute meal because roasting a sweet potato takes at least that long, but the rest is so darn simple. Plus, nothing actually calms me more than the wafting aroma of sweet potatoes roasting in my kitchen. There’s no fancy sauce in this quinoa bowl. You won’t even dirty an extra bowl to mix together a separate dressing. 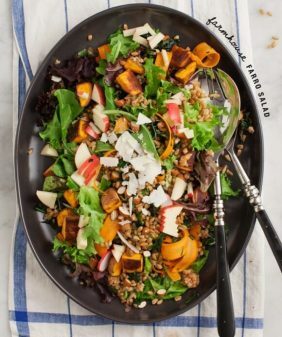 Simply toss the roasted sweet potatoes with quinoa, a bit of feta cheese, and whatever greens, herbs & nuts you might have around. (Although I did have these gorgeous Farmhouse lettuces on this particular day). This combo is so simple, but it’s quite honestly my favorite. Sweet potatoes & feta cheese are a match made in heaven, if you didn’t know already. Dress it simply with a drizzle of olive oil, squeezes of lemon, and a few generous pinches of salt and pepper. 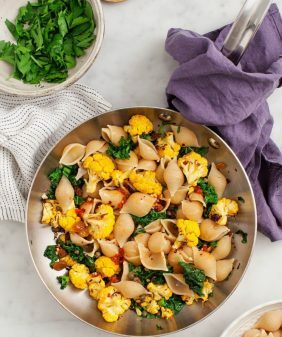 Serve it in bowls and get cozy! 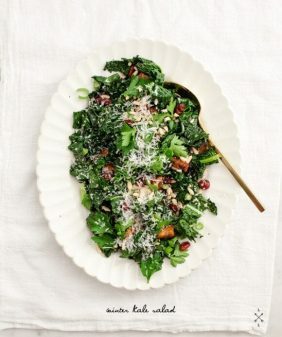 Or skip the bowls and serve it on a platter – this would be an easy, delicious side dish for your Thanksgiving table. For more quinoa bowl recipes, look here or here! 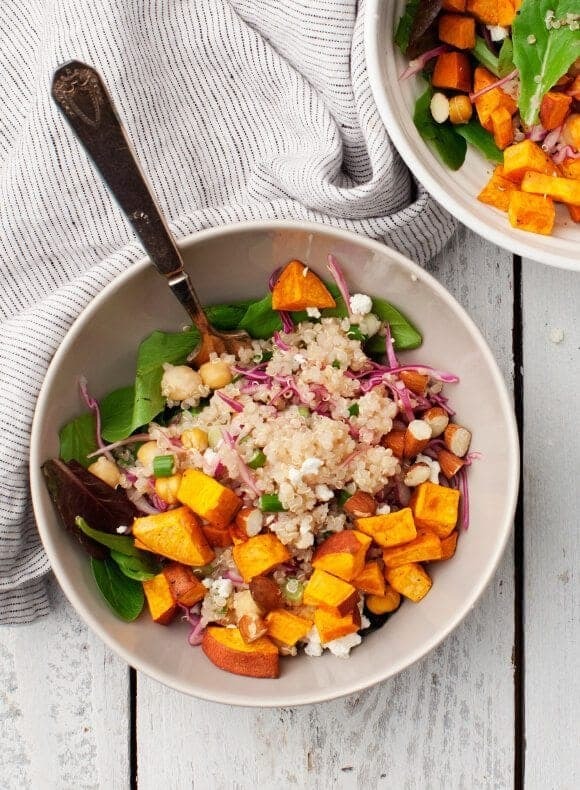 This Simple Sweet Potato Quinoa Bowl is an easy, healthy, and delicious weeknight dinner or make-ahead lunch. It's gluten-free and easily adapts to whatever ingredients you have on hand. Preheat the oven to 400°F and line a baking sheet with parchment paper. Toss the sweet potatoes with a drizzle of olive oil and a few pinches of salt and pepper. Roast until golden brown, 25 to 35 minutes. Toss the roasted sweet potatoes with the chickpeas, quinoa, scallions, cabbage, feta, almonds, and salad greens. Drizzle with olive oil, the lemon juice, and a few generous pinches of salt and pepper. Add more lemon juice and season to taste. Toss and serve in bowls. 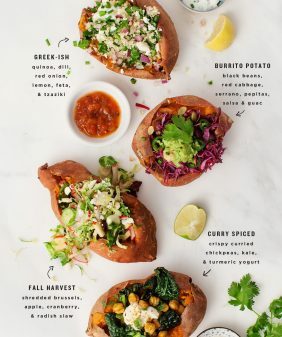 *If you like, add some spice to your sweet potatoes. Toss them with chili powder or a combination of cumin and coriander before you roast them. Skip the feta and add a scoop of pesto or sun cheese (from this recipe) on top. This looks lovely and clean and simple- perfect for the week before Thanksgiving. I love one bowl dinners. 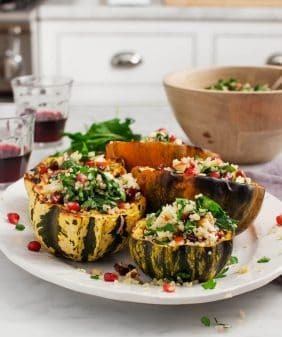 What a wonderful idea to use feta with sweet potato. I am off to the store to pick some up and try! Feta does sound really good. I’ve been on a sweet potato kick, so I’ll need to pick some up soon. We eat a lot of grains with roasted veg around here too. I also use black beans and onions in mine. Spinach is good too. I also love Quinoa bowls. I have just started to like Sweet Potatoes after all these years. This is the sort of bowl I most often crave too. I especially like the addition of red cabbage and scallions in your bowl. This sounds amazing; definitely trying. Hi there! I enjoy one bowl meal! This recipe sounds good and I would like to have a try on it soon! Moreover, this recipe looks simple and easy to prepare and cook. Thanks for sharing this great thing! So I just finished making the recipe! Just a random question: do you serve it hot of cold? using the recipe as you originally posted, could you provide the amount of calories per serving please? Yum! Delicious and so simple. I just made a bucket load of this recipe to feed my husband and me for the next day or so. I had no red cabbage so instead I used a red onion, chopped and left in cold water for about 10 minutes to crisp up. I also added some fresh ginger and a red chilli. I roasted the sweet potato with ground cumin and a few slices of fresh garlic. I didn’t have almonds so I threw in some pine nuts instead. I can see this is going to be one of our “go-to” recipes. I love that it gives me a good base idea and it’s easy to play around with extra ingredients. Thank you for sharing this, it’s just what I need right now! I don’t have much time for cooking and to be honest, I’m not very good at it. I too often end up with takeaway pizza or ready-made, frozen meals. I started looking for healthy recipes that would also be easy and not very time-consuming and I stumbled upon your blog. I’ve started pinning already, thank you! This quinoa bowl looks so good. I like the simplicity of it. I can’t wait to try it. I will be interested to see how much flavor it has. I like the idea of the lemon juice in it. I loved this. A few changes I made: I used arugala instead of the greens. It adds so much flavor. I used extra scallions which was a good idea since the dish does need a little extra seasoning. I also used cinnamon and cumin on my potatoes which was necessary to add flavor. And I didn’t do this but I think it would be delicious to cook the sweet potatoes in coconut oil rather than OO. Lastly, we don’t like Feta so I used parmesan and it worked well. Thanks for this delicious and fresh recipe! The combinations of the ingredients made it delicious! Hi Kristina, I’m so glad you enjoyed customizing these! 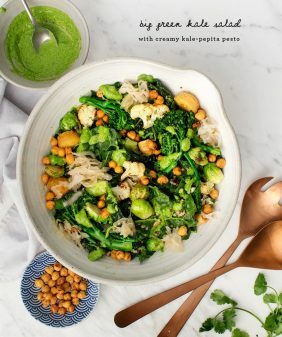 We wanted to add a lot more vegetarian dishes and thought we’d give this a try. We love it and so does our 2 year old son. Extra props because it’s really easy. I’d would definitely recommend. This was amazing!!! Thank you so much!! I scrapped the red cabbage and did baby kale instead of baby salad greens. So amazing. Yay, I’m so glad you enjoyed this one! I made these bowls. Delicious. The family loved them. This is a great recipe for mid-week. I agree the sweet potato is not quick to cook but I could do other things while I was waiting for it to cook so it wasn’t a problem. This recipe will be a regular one in our home from now on. This recipe was so delicious!!! My family & I loved it. Thank you so much for sharing!